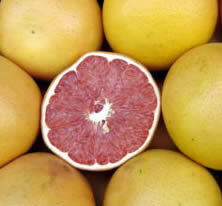 Grapefruit, like many other fruits, is a wonderful addition to many teas. The sweet flavor of grapefruit makes for a very sweet tea indeed, and in many ways is a excellent way to satisfy a sweet tooth. Typically, you'll find grapefruit in various herbal teas, such as the one I just had tonight. But you can also find some green teas that have grapefruit added into the teas as well. Listed on this page are links to reviews of teas on this site that contain or taste like grapefruit, or at least they should.